The Philippines include more than 7000 islands stretching over 1750 km (1100 mi) of the western Pacific. The archipelago was a Spanish colony until the Spanish-American War of 1898, which brought the islands under U.S. administration. Japan occupied the islands during World War II (1942-45), and the country became independent shortly thereafter (1946). Luzon is the largest island of the country. 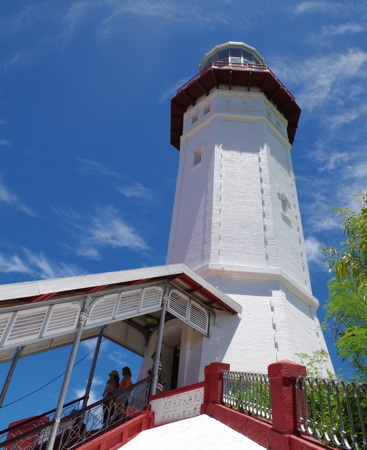 This page describes lighthouses of northern Luzon (the Ilocos and Cagayan Valley regions) plus the central east coast of the island (Aurora Province and the east coast of Quezon Province). 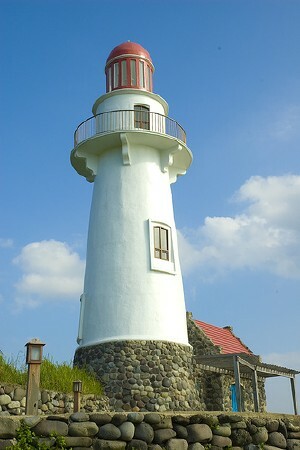 This includes the lighthouses of the Batanes Islands to the north of Luzon. The Philippines is divided into 79 provinces, and the lighthouses are listed by province. The lighthouse preservation movement is gaining some momentum in the Philippines. Until recently, all of the historic light stations were in very poor condition. However, the Philippines Coast Guard, which operates aids to navigation in the country, has recently repaired and renovated many of the towers. An "adopt a lighthouse" program has taken hold, and there's hope more extensive restorations will be carried out within the next few years. 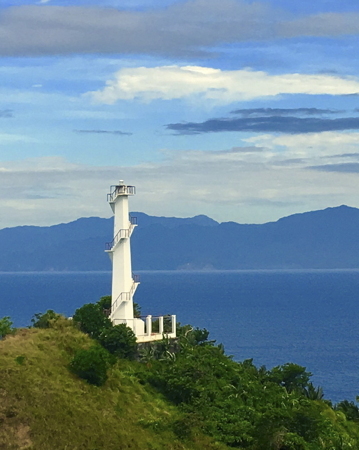 Lighthouses in the Philippines are maintained by the Coast Guard's Marine Safety Services Command. Filipino and English are official languages in the Philippines. In Filipino, lighthouses are called parolas; an island is isla or pulo. 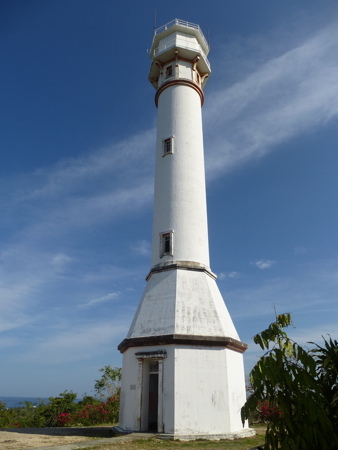 Many Philippine lighthouses are not well known, so better information and photos are needed. ARLHS numbers are from the ARLHS World List of Lights. PCG numbers are the Philippines Light List numbers, where known. Admiralty numbers are from volume F of the Admiralty List of Lights & Fog Signals. U.S. NGA List numbers are from Publication 112. 8 historic photos posted by Johann Stockinger. Wikipedia article, with links to articles on several of the individual lighthouses. The Directory's own list of the Spanish light stations, with notes on their current status. Lists of active lighthouses maintained by MSSC. Navigational chart information for the Philippines. Date unknown. Active; focal plane at least 25 m (82 ft); three white flashes every 15 s. Approx. 10 m (33 ft) white fiberglass tower. No photo available, and Google has only a distant satellite view. Located on Adette's Cliff, a bluff between the villages of Cabaongan and Baruan. Site status unknown. Admiralty F2686; NGA 14390. Date unknown (station established before 1920). Active; focal plane about 25 m (82 ft); green flash every 5 s. Approx. 10 m (33 ft) slender square concrete tower with an external concrete stairway winding around the tower, similar to the Lucap light (see below). Kristoffer Rey Eusebio has a photo, a photo taken at the top of the lighthouse is available, and Google has a satellite view. Curious "umbrella rocks" on the beach below the lighthouse are a tourist attraction. Located on a promontory on the north side of the Mabini River entrance northwest of Agno. Site open, tower closed. PCG-0629; Admiralty F2686.6; NGA 14391. 1905. Active; focal plane 90 m (294 ft); white flash every 5 s. 27 m (89 ft) round cylindrical concrete tower with octagonal watchroom, lantern, and double gallery, mounted on an octagonal pyramidal base. Lighthouse painted white with red trim. 1-story keeper's houses in ruins. A photo by Jacques Beaulieu is at right, a 2009 photo and a 2008 photo are available, and Google has a street view and a satellite view. Probably the best known U.S.-built lighthouse in the Philippines. The Bolinao Bank has posted some of the history of the light station. 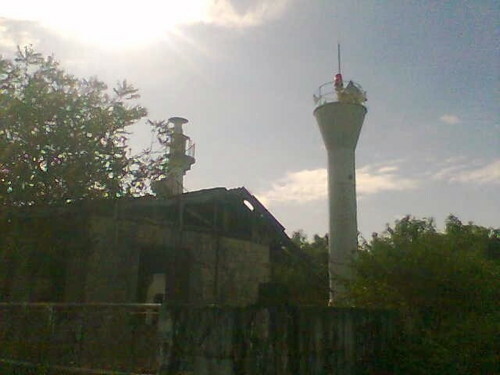 In 2005 the Municipality of Bolinao signed an agreement to maintain and restore the lighthouse. The lantern was removed during the restoration; a photo is available showing the tower with no lantern. A photo showing the previous appearance of the lighthouse is also available. Located on heights about 25 km (15 mi) southwest of the point of the cape. Accessible by road. Site open, tower open for climbing but the schedule is unknown. ARLHS PHI-015; PCG-0033; Admiralty F2688; NGA 14392. Date unknown (station established 1905). Active; focal plane 26 m (85 ft); white flash every 5 s. 13.5 m (44 ft) slender square concrete tower with an external concrete stairway winding around the tower. The tower is floodlit at night. A closeup photo is available, but trees hide the light in Google's satellite view. Port Bolinao is a sound sheltered by Santiago Island at the northern tip of the Cape Bolinao peninsula. Located on a promontory at Guiguiwanen Beach, on the south side of the sound. Site probably open, tower closed. ARLHS PHI-068; Admiralty F2690; NGA 14396. Date unknown. Active; focal plane about 17 m (56 ft); two white flashes every 10 s. Approx. 12 m (39 ft) round hourglass-shaped white fiberglass tower. Angel Maramot has posted a photo, and Google has a satellite view. Located at the northern tip of a small (but inhabited) island off the northern tip of the Cape Bolinao peninsula. Accessible only by boat. Site open, tower closed. PCG-0032; Admiralty F2689; NGA 14397. Date unknown. Active; green flash every 5 s. Approx. 20 m (66 ft) slender square white concrete tower with an external concrete stairway winding around the tower. The stairway is painted red in a 2018 photo by Angelic Junel Gonzales. A view from the sea is available, and Google has a street view and a satellite view. Small lights of this distinctive design are common in the Philippines. Located on the waterfront at Lucap, on the west side of Lingayen Gulf about 5 km (3 mi) northeast of Alaminos. Site open, tower can be climbed. ARLHS PHI-116; Admiralty F2691; NGA 14398. Date unknown. Active; focal plane at least 25 m (82 ft); red flash every 5 s. 10 m (33 ft) concrete mast, similar to a telephone pole. A portfolio of photos is available on Facebook, and Google has an indistinct satellite view. The light stands in the midst of ruins of a Spanish watchtower. Portuguese Point is a peninsula sheltering the harbor of Sual, one of the earliest Spanish outposts in the Philippines. Located on the point, at the southwestern corner of Lingayen Gulf. Site open, tower closed. Admiralty F2692; NGA 14399. Date unknown (station established about 1885). Active; focal plane 14 m (46 ft); white flash every 5 s. Approx. 11 m (36 ft) slender square white concrete tower with an external concrete stairway winding around the tower, very similar to the Lucap light. The railing and the sides of the steps are painted yellow. Gerard Castaneda has a good photo, and Google has a satellite view. The original lighthouse was a cast iron tower similar to San Fernando (1). It was replaced in the 1920s by a 5 m (17 ft) octagonal concrete structure with a lantern centered on the top. Oddly, the international light lists continue to describe this structure. Dagupan is a city of about 175,000 residents at the head of Lingayen Gulf. Located on the north side of the entrance to the Dagupan River. Site open, and nothing prevents climbing the tower. ARLHS PHI-104; Admiralty F2694; NGA 14400. Date unknown. Active; focal plane 12 m (39 ft); red flash every 5 s. 10 m (33 ft) slender square white concrete tower with an external concrete stairway winding around the tower. Google has a street view and a satellite view. Located at the foot of the pier in Damortis, a small fishing port about 30 km (19 mi) northeast of Dagupan. Site open, tower closed (fenced). Admiralty F2696; NGA 14405. Date unknown. Active; focal plane unknown; red flash every 5 s. Approx. 15 m (49 ft) square cylindrical concrete church steeple; the light is shown from a bracket mounted in the belfry. A photo is available, and Google has a satellite view. Located in the village of Santa Rita, on the east side of Lingayen Gulf about 40 km (25 mi) north of Dagupan. Site open, tower status unknown. Admiralty F2697; NGA 14406. 1885. Inactive. Approx. 6 m (20 ft) round cylindrical steel tourelle, prefabricated in France. U.S.-built keeper's house nearby. Lantern removed long ago. One of eight steel towers prefabricated in France for the Philippines. The tower is at the lower left in Ramon Velasquez's photo at right, Dmitry Ishanin has a closeup photo, Sigmund Perona also has a closeup, another photo (2/3 the way down the page) shows both light towers, and Google has a satellite view. Located at the edge of the cliff near the modern lighthouse (next entry); clearly endangered by neglect and by erosion of the cliff. Site open, tower closed (military installation). ARLHS PHI-097. 1979. Active; focal plane 33 m (107 ft); two white flashes every 10 s. Approx. 20 m (66 ft) round concrete tower with gallery but no lantern, unpainted. Several small buildings around the base of the tower. A 2018 photo at right, Rizza Fernandez has a 2015 photo, a distant photo is available, Wikimedia has a view from the sea by Ramon Velazquez, and Google has a satellite view of the station. It's clear from the closeup photo that the height of the lighthouse is much greater than the 8 m (27 ft) listed. In 2012, after years of negotiation, the Poro Point Management Corporation signed an agreement to restore the lighthouse. In 2015 the corporation was seeking bids for tourist development at the station. Located on a headland at the end of a club-shaped peninsula about 5 km (3 mi) west of San Fernando, at the eastern entrance to Lingayan Gulf. Site open, tower open but no schedule information is available. ARLHS PHI-053; Admiralty F2698; NGA 14408. Date unknown. Active; focal plane 10 m (33 ft) (? ); green flash every 5 s. Approx. 10 m (33 ft) triangular cylindrical concrete skeletal tower. Google has a street view and a satellite view. The listed focal plane is certainly too low. Located on a hilltop on the south side of Darigayos. Site status unknown, but the light is visible from the highway. Admiralty F2705; NGA 14424. 1950s. Active; focal plane 15 m (49 ft); red flash every 5 s. Approx. 11 m (36 ft) concrete post with a buttressed base. Google has a street view and a satellite view. Located at the north end of Darapidap Beach in Candon, in Ilocos Sur province. Site open, tower closed. PCG-0019; Admiralty F2712; NGA 14432. 2011(?). Active; focal plane 10 m (33 ft); red light, 2.5 s on, 2.5 s off. 8 m (26 ft) barbell-shaped round white fiberglass tower. No photo available, and the tower has not been located in Google's satellite view of Apatot Beach. Located on the coast in San Esteban. Site open, tower closed. PCG-0502; Admiralty F2713; NGA 14434. 2011. Active; focal plane about 14 m (46 ft); white flash every 10 s. Approx. 10 m (33 ft) barbell-shaped round white fiberglass tower. No photo available, but Google has a satellite view. Located on a tombolo (island joined to the mainland by a narrow neck) at Magsingal. Site status unknown. Admiralty F2715; NGA 14438. 1906. Inactive. Approx. 9 m (30 ft) stone tower. No photo available, but Google has a satellite view of the station. This lighthouse is believed to be an old Spanish outpost, built to warn of attacks by Moro pirates and then used under U.S. administration as a lighthouse. A 1920 light list describes the light as an "old fort". Several Currimao tourist sites list the lighthouse as an attraction. Located at the entrance to Gaang Bay and Currimao, about 32 km (20 mi) south of Laoag City. Site apparently open, tower status unknown. ARLHS PHI-004. Date unknown (station established 1906). Approx. 7 m (23 ft) slender square concrete tower, with an external concrete stairway winding around the tower. A closeup photo is available. Date unknown (station established 1906). Active; focal plane 49 m (161 ft); red flash every 5 s. 10 m (33 ft) round hourglass-shaped tower, painted white. Mapio.net has photos (one is at right), and Google has a satellite view of the station. In the satellite image the newer lighthouse appears a few feet to the left (west) of its predecessor. Site apparently open, tower closed. Admiralty F2720; NGA 13996. 1892. Active; focal plane 118 m (386 ft); three white flashes every 5 s. 20 m (66 ft) octagonal cylindrical brick tower, painted white, attached to a 1-story brick keeper's house. Portions of the original 1st order Fresnel lens, badly damaged by an earthquake in 1990, remain in the lantern; a small modern lens is mounted inside what's left of the original lens. The original rotating mechanism is intact. Assistant keeper's houses and other light station buildings. This is a staffed station. A photo is at the top of this page, another photo is available, John Ryan Cordova has a closeup of the tower, Wikimedia has numerous photos, and Bing has a satellite view. This historic lighthouse, with its classic Spanish colonial architecture, is easily the best known and most visited light station in the country; the keepers often provide tours. It has been in dilapidated condition for years and was further damaged by Typhoon Feria in 2001. In 2003 the Coast Guard signed an agreement with Cape Bojeador Lighthouse Development Inc., a quasi-public, nonprofit organization that plans to restore and operate the lighthouse. This effort is reported to be supported by the government of Ilocos Norte province. However, there was a long delay. A January 2010 photo is nearly identical to a 2005 photo. In 2014 the work finally got underway. Ian Carolino has a photo of the lighthouse surrounded by scaffolding, another photo shows the tower repainted, and the photo at the top of this page shows the results of the restoration. Additional "rehabilitation" work was announced in 2017. Located at the northwestern corner of the island and the country 45 km (28 mi) north of Laoag. Accessible by road. Site and tower open. ARLHS PHI-012; Admiralty F2722; NGA 14000. Note: The Batanes, or Batan Islands, are located in the Luzon Strait between Taiwan and Luzon. Lying about 160 km (100 mi) north of the Luzon mainland, they are readily accessible by air from Manila. In 2000 the provincial government of Batanes announced a plan to build three lighthouses, primarily as tourist attractions in the islands and secondarily as navigational aids. 2014(?). Inactive pending repairs; listed with focal plane 20 m (66 ft); white flash every 5 s. White concrete tower, form and height unknown. No photo available; Google has a distant satellite view of the location. Yami is the northernmost island of the Philippines. Its name has been spelled Y'Ami, Dihami, and Diami; Wikipedia calls it Mavulis, and NGA has it as Amianan. PCG awarded a contract to build a lighthouse in 2014, but apparently this did not go well, and in 2016 it advertised for a contractor to reconstruct a lighthouse. Located on the northern tip of the island. Accessible only by boat. Site open, tower closed. Admiralty F2823; NGA 13992. 2003. Active; focal plane unknown; white flash every 4 s. Approx. 20 m (66 ft) round concrete tower with lantern and gallery, mounted on a round rubblestone base and attached to a small 1-story rubblestone "cottage" that serves as a visitor entrance. Lighthouse painted white with red trim; lantern painted red. NGA and PCG formerly listed the light as having a red flash, but the lamp is clear. A photo by Gamalielh Ariel Benavides is at right, another good photo is available, Bing Ramos's photo has a view of the location, and Google has a street view and a satellite view. Located on a hill on the north side of Basco, the principal town of Batan Island. Accessible by road or by a walk of about 1.2 km (3/4 mi) from the town. Site open, tower open for climbing but no schedule is available. Admiralty F2822.5; NGA 13990. 2004. Active; focal plane unknown; white flash every 5 s. Approx. 18 m (59 ft) hexagonal concrete tower with lantern and gallery, mounted on a hexagonal rubblestone base and attached to a small 1-story rubblestone "cottage" that serves as a visitor entrance. Lighthouse painted white with red trim; lantern painted red. Xavier Immanuel Ignacio has a nice photo of the station, Oggie Ramos has a closeup, and Google has a street view and a satellite view. This lighthouse stood inactive for many years, but the Admiralty announced it as operating in May 2016. Located on a hill on the east side of Batan Island opposite Mahatao, about 5 km (3 mi) southeast of the Basco lighthouse. Site open, tower status unknown. This light is not listed by NGA. Admiralty F2822.3. 2006. Listed as inactive by PCG; focal plane unknown; flash every 5 s, either white (NGA) or red (PCG). Approx. 18 m (56 ft) round rubblestone tower with lantern and gallery. The tower is unpainted; the watch room and trim are painted white and the lantern red. An adjoining rubblestone cottage had not been completed as of spring 2007. An April 2007 photo is available, also an October 2007 closeup and an August 2008 photo by Christie Manguiat, and Google has a satellite view. Evidently the funds to complete the cottage ran out. A 2011 photo shows the cottage finally roofed, and Ania Błażejewska has a recent photo. Sabtang Island is a short distance south of Batan Island. Located on a rocky promontory on the north side of Sabtang village, on the northeast side of the island. Site open, tower appears closed. Admiralty F2820; NGA 13991. Date unknown. Active; focal plane unknown; white flash every 10 s. Concrete tower, form and height unknown. No photo available; Google has a distant satellite view of the location. Balintang is an uninhabited island in the Balintang Passage, roughly halfway between the Batanes and Babuyan Islands. Accessible only by boat. Site and tower closed. Admiralty F2819; NGA 13985. Date unknown. Inactive since about 2006. Approx. 12 m (39 ft) concrete post with a stairway spiraling around the tower. Dong Perez has a 2017 photo, and Mark Ico has a distant view. Located on the slope below the current lighthouse. Site open, and the tower can be climbed. 2006(?). Active; focal plane unknown; white flash every 5 s. Approx. 14 m (46 ft) round barbell-shaped white fiberglass tower. No photo available, but Google has a satellite view. Calayan is the largest of the Babuyan Islands, which lie in the Luzon Strait off the north coast of Luzon. Located on the southeastern tip of the island. Accessible by a rather challenging hike. Site open, tower closed. Admiralty F2818.8; NGA 14146. Date unknown. Active; focal plane 62 m (203 ft); white flash every 5 s. 6.5 m (21 ft) square tower possibly mounted atop a 1-story keeper's cottage or equipment building. The top of the tower is seen in Jay Apostol's photo, and Google has a satellite view. This appears to be a historic small lighthouse; more information is needed on its history. It is perched atop a giant monolith that is the only conspicuous landmark on a low, sandy coastline. Located above the beach about 10 km (6 mi) east of Claveria. Site status unknown. PCG-0012; Admiralty F2724; NGA 14004. Date unknown (station established 1896). Active (? ); listed with focal plane 11 m (36 ft); white flash every 5 s. 9 m (30 ft) "white metal tower and dwelling," according to NGA. This sounds like a description of the original lighthouse, a typical French tourelle, prefabricated in Paris by Sautter Lemonier & Cie. Wikimedia has a 1903 photo that shows the lighthouse just off the beach. Manuel Noche visited this site around 2002 and found only rubble in the surf, but we don't know if these remains were of the French lighthouse or of a later replacement. PCG describes the current tower as "steel," suggesting a skeletal tower. Google has a satellite view of the station, but the light is not seen. Google also has a street view that probably shows the foundation of the historic keeper's house. Located on the west side of the entrance to the Cagayan River opposite Aparri on the north coast of Luzon. Site status unknown. ARLHS PHI-085; Admiralty F2728; NGA 14008. Date unknown. Active; focal plane 11 m (36 ft); white flash every 5 s. 9 m (30 ft) round hourglass-shaped tower, painted white. Ralf Tammocalao has a 2014 photo, a November 2008 photo is available, and Google has a street view and a satellite view. 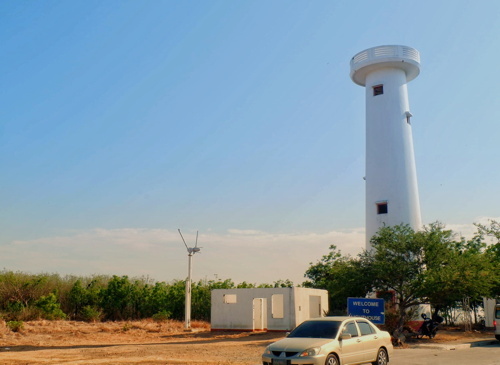 Clearly this light replaces the historic Linao Point Light (previous entry) in marking the mouth of the Cagayan River, the largest river of the Philippines. Located on the east side of the entrance to the Cagayan River in Aparri. Site open, tower closed. Admiralty F2728.5; NGA 14009. Date unknown. Active; focal plane about 9 m (30 ft); white flash every 5 s. Approx. 9 m (30 ft) slender square white concrete tower with an external concrete stairway winding around the tower. Google has a street view, but the white tower is not seen in Google's satellite view. Located on the north side of the mouth of the Palawig River in Santa Ana. Site open, tower closed. Admiralty F2730.5; NGA 14014. Date unknown. Active; focal plane 9.5 m (31 ft); red flash every 5 s. 9.5 m (31 ft) white concrete post centered on a robust pyramidal base. No photo available, but Google has an indistinct satellite view. San Vicente is a fishing port at the tip of the peninsula opposite Palaui Island and Cape Engano (next entry). Located at the tip of a shoal across from the San Vicente waterfront. Accessible only by boat. Site open, tower closed. Admiralty F2730; NGA 14016. 1893. Active; focal plane 100 m (327 ft); white flash every 5 s. 14.5 m (47 ft) octagonal cylindrical stone tower, painted white, attached to 1-story stone keeper's house. Lantern removed and replaced with a solar-powered light. Gravely endangered. The keeper's houses and other light station buildings have fallen into ruin and chunks of the tower have fallen. Bert Balonzo's photo is at right, a photo of the tower shows the poor condition of the building, a 2010 photo and a 2012 photo are available, Stockinger has a historic photo, Rudel Saldiver has a street view from below the lighthouse, and Google has a distant satellite view of the station. Free-lance author Jacqueline Ong visited in the summer of 2008 and found the lighthouse seriously deteriorated. In March 2010 the National Museum declared the station to be an "important cultural property," which qualifies it for federal restoration funding. Wikimedia has a photo of the lighthouse as it appeared in 1904. The lighthouse stands at the extreme northeastern corner of the Philippines and is a traditional landfall for ships arriving from the Pacific; it marks the eastern entrance to the Babuyan Channel, which provides the shortest route around the north end of Luzon. Located at the northern end of Palaui Island. Accessible only by boat. Site open, tower open but dangerous. ARLHS PHI-013; Admiralty F2732; NGA 14020. 2016. Active; focal plane at least 30 m (98 ft); white flash every 5 s. No description provided. No photo available, and the tower is not seen clearly in Bing's satellite view. This new lighthouse is very likely to be a white fiberglass tower. Located on the easternmost point of the Santa Ana peninsula at the northeastern corner of Luzon. The area is quite wild. Site status unknown. Admiralty F2733. Date unknown. Active; focal plane about 15 m (49 ft); white flash every 5 s. Approx. 12 m (39 ft) round barbell-shaped white fiberglass tower. No photo currently available, and the exact location of this light is unclear. Located on the beach near Aplaya. Site open, tower closed. PCG-0581; Admiralty F2735; NGA 14007. Date unknown. Active; focal plane unknown; white flash every 5 s. No description provided, but this light is probably a twin of the Maconacon lighthouse. No photo available, but Google has a satellite view. Located on Palanan Point, marking the entrance to Palanan Bay; this is the easternmost point on Luzon's northeast coast. The remote location is accessible only by boat. Site status unknown. Admiralty F2737; NGA 14006. Date unknown. Active; focal plane unknown; white flash every 5 s. Approx. 10 m (33 ft) white tower. No photo available, but Google has a satellite view. Located on a sharp promontory sheltering Dilasag Bay. Site status unknown. Admiralty F2740.5. Date unknown. Active; focal plane at least 70 m (230 ft); white flash every 5 s. Approx. 15 m (49 ft) white concrete tower with a stairway spiraling around the tower. A photo is at right, a Facebook page for the lighthouse has several photos, Arwin Francis Guinto has a view from the sea, and Bing has a satellite view. Located at the end of a sharply pointed peninsula in northern Aurora. Accessible by a hiking trail. Site open, tower closed. Admiralty F2741. Date unknown. Active; focal plane about 10 m (33 ft); red flash every 5 s. 9 m (30 ft) slender square concrete tower with an external concrete stairway winding around the tower. Gerard Casteneda has a 2010 photo, and Google has a closeup street view, but the tower is not seen in Google's fuzzy satellite view. Located on the beach to the west of the harbor entrance at Baler, a beach resort and the capital of Aurora province. Site open, and there's no obstacle to climbing the stairway of the tower. Admiralty F2742; NGA 14024. Date unknown. Active; focal plane unknown; white flash every 5 s. Approx. 16 m (52 ft) square white concrete tower with a stairway spiraling around the tower. Sotero Pineda has a 2017 photo, Marvin Butchayo has a street view, and Google has a satellite view. This lighthouse apparently replaced an older light; we need information on its history. This is a landfall light located high on a prominent cape about 10 km (6 mi) east of Baler. Site open, but reaching it requires a scramble up a steep slope. The tower can probably be climbed. Admiralty F2742.2. Date unknown. Active; focal plane unknown; white flash every 5 s. Approx. 12 m (39 ft) square white concrete tower with a stairway spiraling around the tower. Marben Solania has a 2017 photo, Eric Corpuz has a street view, and Google has a satellite view. This is a landfall light located high on a prominent cape about 10 km (6 mi) southeast of Dingalan. Site open, but reaching it requires a substantial hike. The tower can probably be climbed. Admiralty F2742.5. Date unknown. Active; focal plane 17.5 (57 ft); continuous red light. 16.5 m (54 ft) white concrete tower with a stairway spiraling around the tower. Ardjel Dejaño has a 2017 photo, but the tower is not seen in Google's satellite view. This light was formerly mounted on a church tower, but trees surrounding the church probably grew tall wnough to obscure the light. The front light is on a square concrete post. Polillo Island is a large island off the north coast of Quezon province. Located in Polillo, on the southwestern coast of the island. Site open, tower closed. Admiralty F2746.1; NGA 14032. Date unknown. Active; focal plane about 20 m (66 ft); three white flashes every 5 s. Approx. 9 m (30 ft) round white fiberglass tower. No photo available, but Google has a satellite view. Located on a headland on the northwest coast of Polillo Island. Site status unknown. Admiralty F2747.5; NGA 14026. Date unknown. Active; focal plane about 10 m (33 ft); white flash every 5 s. Approx. 10 m (33 ft) concrete post, probably with a stairway winding around the tower. No photo available, but Bing has a distant satellite view. Located just offshore in the harbor of Burdeos, on the east coast of Polillo Island. Site status unknown. Admiralty F2747; NGA 14036. Date unknown. Active; focal plane 13 m (43 ft); continuous red light. 10 m (33 ft) slender white concrete tower with an external stairway winding around the tower. Randy Establecida has a photo, and Google has a street view, but the slender tower is not seen in Google's satellite view. Located on the waterfront of Real, a fishing port on the west side of the Polillo Strait. Site open, tower closed. Admiralty F2749.5; NGA 14045. Date unknown. Active; focal plane unknown; red flash every 10 s. Concrete tower, height unknown. No photo available, but Bing has a satellite view of the station. Located on a swampy point about 3 km (2 mi) northeast of Mauban. Site status unknown. Admiralty F2757; NGA 14060. Date unknown. Active; focal plane about 9 m (30 ft); white flash every 5 s. Approx. 9 m (30 ft) slender square concrete tower with an external concrete stairway winding around the tower. Manol Diaz has a view from the harbor, and Google has a street view, but the slender tower is not seen in Google's satellite view. Located on the waterfront in Plaridel, a fishing port near the south end of Lopez Bay. Site open, tower closed. Admiralty F2759; NGA 14074. Date unknown. Active; focal plane 17 m (56 ft); white flash every 5 s. 9 m (30 ft) slender white concrete tower with a buttressed base. No photo available, but Google has an indistinct satellite view. Located on a small island off the northwestern end of Alabat Island, marking the entrance to Lopez Bay. Site open, tower closed. Admiralty F2750; NGA 14056. Created July 24, 2005. Checked and revised August 11, 2018. Lighthouses: 46. Site copyright 2018 Russ Rowlett and the University of North Carolina at Chapel Hill.